In an effort to continue to bring you the best free spell cards available, Perram's Spellbook is getting a major upgrade! This new version of the app will include several user requested features. Expect this page to change rapidly and drastically over the next few weeks! PDFs! - From now on, Perram's Spellbook will generate PDF documents instead of printable web pages. You can save them to your hard drive after it creates them, or print them out right on the spot. Since it is a standard PDF document, you'll be able to size, resize, and print on any device without having to worry about what browser you are using! Improved layout and graphics! - I think this will be obvious once you make your first set of cards. I worked hard to make them look good, guys! Exact Match Font Sizes - The spellbook will no longer print a second card when you can obviously see it could have fit on just one! It now knows exactly how many cards it takes, and will try its best to fit it onto a single card if possible. UPCOMING - Large Font Option - Fear not about the tiny text size on some cards! You'll be able to tell the app to manually print a larger font size. Doing this WILL mean that you'll have more cards to print as longer spells spill over to 2nd and 3rd cards. UPCOMING - List Format - Don't want cards, just a nice printable spell list? You'll be able to do just that! No headache required. UPCOMING - Random Spellbooks! - This one is for you GMs out there! Hit a button and a random spellbook will be generated instead of having to select your spells manually! UPCOMING - Better Interface, More Controls! - I know things look pretty spare right now, but don't worry. These controls and the whole app will be getting a face lift before launch. Your Feedback is Needed - Now More than Ever! Nearly every feature in Perram's Spellbook is the result of a user asking for it! So if you have any comments or questions, email me at jefferson.thacker@gmail.com. : #71: Rasputin Must Die! 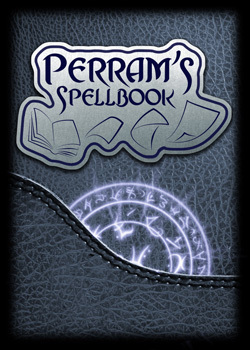 Perram's Spellbook Copyright 2010 - 2013 Jefferson Jay Thacker.